Debutant Stephen Best and goalkeeper Dean Delany produced a stellar performance as Bohemians kept out bitter rivals Shamrock Rovers following a drab Dublin derby in Tallaght on Friday night. The raucous crowd kept the passion going, but there was little in the way of quality attacking from either side in front of close to 4,000 fans. Bohs boss Keith Long will undoubtedly be the happier manager as his charges achieved a fourth clean sheet in five games, and kept a Rovers side with big-name internationals at bay for most of the contest. It’s now almost three years since the Gypsies lost a league game at the home of the Hoops, writes KEVIN FAGAN. Long made just one enforced change from Tuesday night’s frustrating encounter with Dundalk. 18 year-old Best came in for the suspended Anto Murphy, and put in a performance that showed an amazing level of maturity and composure from such a young man. Although Rovers manager Pat Fenlon predictably started with just one striker, Best and Derek Prendergast kept in-form Mikey Drennan very quiet all night. As is customary with these derby matches, the game was played at a helter-skelter pace. Bohs had the better of the possession in the first half, but could create little in the way of chances. There seemed to be a slight panic in the play from both sides, with a ‘nothing silly’ option being taken 90 per cent of the time. 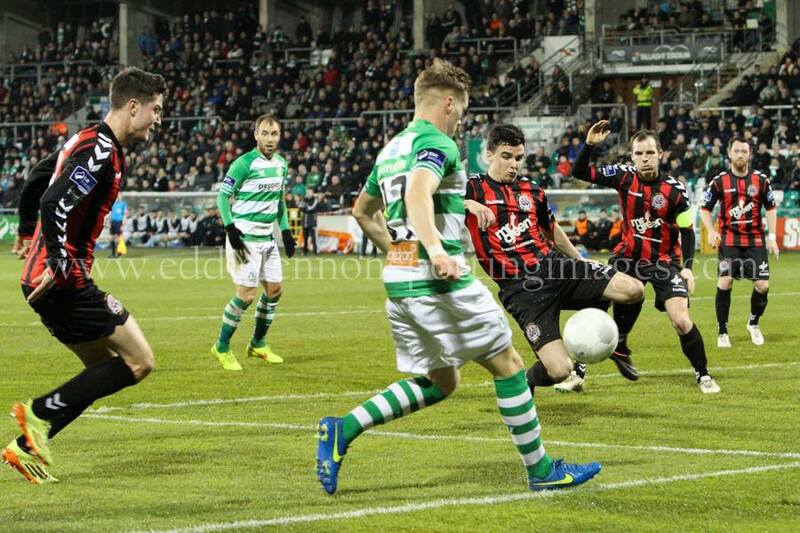 This was an understandable position for Bohs, but Fenlon’s Hoops were particularly poor. Keith Fahey and Stephen McPhail may have 28 international caps between them, but they were outfought and out-battled by Roberto Lopes and Robbie Creevy in midfield. Lopes was particularly good breaking up Rovers play, and was ridiculously booked for a pinpoint tackle on Sean O’Connor. Unfortunately, Bohs’ only half-chance came just before the break. Derek Pender’s cross bounced off Adam Evans and fell kindly for Dean Kelly, but the striker’s volley was well blocked by David Webster. At the other end, Rovers’ only effort on target in the first half came from a late Conor Kenna header, but it was comfortable for Delany. Rovers were clearly given an earful from Fenlon at the break, as they came out much more composed in the second period. The Bohs backline held firm, with Best outstanding. The youngster was commanding in the air, controlled in possession, and positioned himself like an old pro. The game was trundling toward a chance-less disappointment, but a flurry of late action brought the best out of Delany, and further irked the naturally belligerent Rovers faithful. The Hoops improved greatly with the introduction of Kieran ‘Marty’ Waters and the considerable bulk of Danny North, and with twelve minutes to go, Waters crossed for Ryan Brennan, whose header was brilliantly clawed away by Delany. Then, in the 81st minute, an almighty scramble in the Bohs box followed a corner. Delany saved low to his left from North, and the defence somehow got the ball clear when Rovers looked certain to score rebounds on two occasions. Their final chance came in injury time, when Waters’ back post cross found Drennan, but his header looped agonizingly onto the top of the bar, and out for a goal kick. The Bohs manager’s clenched-fist celebrations after the game said it all – this was a hard won point at a ground where most will be beaten this season. Shamrock Rovers: Craig Hyland, Simon Madden, Dave Webster, Conor Kenna, David O’Connor, Sean O’Connor (Kieran ‘Marty’ Waters, 70), Pat Cregg, Stephen McPhail (Ryan Brennan, 60), Keith Fahey, Gary McCabe (Danny North, 84), Michael Drennan. Subs not used: Barry Murphy, Maxime Blanchard, Gavin Brennan, Gareth McCaffrey. Bohemians: Dean Delany, Derek Pender, Derek Prendergast, Stephen Best, Lorcan Fitzgerald, Paddy Kavanagh, Roberto Lopes, Robbie Creevy, Adam Evans (Karl Moore, 75), Keith Buckley (Kealan Dillon, 61) Dean Kelly (Jason Byrne, 79). Subs not used: Lee Steacy, Adam Wixted, Marc Griffin, Dylan Hayes.